Relations between Britain and France have had their strained moments over the years, but it is fair to say that the Eurostar railway service between London and Paris has been a great boost to the famed Entente Cordiale. In little over two hours, Britons can swap central London for lovely food and wine in an atmospheric Parisian bistro. While French travellers coming in the opposite direction can perhaps enjoy a pint or two in a branch of UK pub chain Wetherspoons, or maybe visit an Aberdeen Angus steakhouse. But not before the French visitors had - until two years ago - first arrived at Waterloo Station, named after the nearby bridge over the Thames that was so called to commemorate the Battle of Waterloo - Britain's 1815 victory over France. Leaving Anglo-French history to one side, although it remains easier for people in other parts of the UK to continue to fly to Paris, the convenience of the Eurostar service for passengers in or near London is obvious. Instead of having to check in at an airport two hours before your flight, you simply have to arrive half an hour before your Eurostar departure - setting off since 2007 from the impressively renovated St Pancras Station - and the train takes you directly to Gare du Nord in the centre of Paris. And if Paris doesn't tickle your travel fancy, you can instead take the Eurostar to Brussels, the capital of Belgium, or Lille in northern France. Celebrating its 15th anniversary on Saturday, Eurostar's success is borne out by its passenger numbers. Since services first started on 14 November 1994, more than 100 million people have travelled on Eurostar, with 10 million expected to do so this year. To put this into context, Eurostar now accounts for 80% of all rail or air passengers travelling directly between London and Paris, while London's airports share the remaining 20% between them. 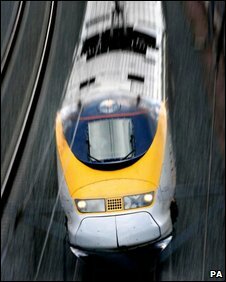 This success has unsurprisingly attracted the attention of rail companies across Europe - and from 1 January 2010, passenger train services through the Channel Tunnel are being opened up to competition. But travellers looking forward to trying out a rival provider will probably have to wait a few years, simply due to the logistics of getting the specific rolling stock needed to gain the strict safety clearances to go through the Channel Tunnel. "We are very much victims of our own success," says Eurostar chief executive Richard Brown. "We have proven that it is a very attractive proposition. "Who will likely become our competitors? We don't know - they won't be telling us beforehand. "What we do know is that it isn't going to happen quickly. It is a big job to start up - you need to get the trains, you need to recruit staff. "In our opinion, we certainly won't have a rival next year, and I also don't think so in 2011." Commentators agree that Eurostar's most likely first competitor will be Germany's state-run railway company, Deutsche Bahn. 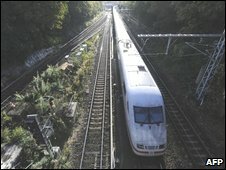 Press reports going back to 2007 have said Deutsche Bahn would like to run direct services from London to German cities such as Frankfurt and Cologne. The company itself is far more reticent. "We have no plans in the next year or so," says spokesman Andreas Fuhrmann. Instead, he says, Deutsche Bahn's continuing focus at present is to ensure that its timetables from Brussels to Frankfurt and Cologne fit in with Eurostar's arrivals, to ensure that waiting times for customers continuing on to Germany are as short as possible. The Netherland's state-run railway company, Nederlandse Spoorwegen, has also been named as a possible provider of services through the Channel Tunnel from London to Amsterdam. Yet it, too, said its current focus was "establishing a high-quality and smooth connection" between Eurostar services in Brussels and its trains to and from the Netherlands. But even if a rival train company has the required rolling stock to start operations through the Channel Tunnel, how easy would it be to get clearance from its owner, Eurotunnel? Apparently, it wouldn't be difficult at all. "If a company has its trains safety certified for the tunnel, then they could effectively start straight away," says a Eurotunnel spokesman. "There is space for rival train firms, and as we charge an access fee per train, it is in our interest to see more go through the tunnel." 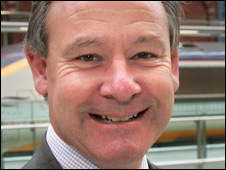 He adds that the opening up of the Channel Tunnel to competition was a European Union decision, and that it only applies to seated passenger services. As a result, Eurotunnel's own monopoly on shuttle services carrying people in their cars, coaches and lorries through the tunnel from Folkestone in Kent to Coquelles near Calais will continue. High Speed One, the operator of the high rail speed link from St Pancras in London to the Channel Tunnel, also confirmed it would be pleased to see rivals use the service - and as importantly, that there was the space for them. "It would be great to look up at the departure board at St Pancras International and also see cities like Amsterdam, Cologne and Frankfurt as direct destinations," said High Speed One director of communications Ben Ruse. Back at Eurostar, Mr Brown highlights the fact that it already runs direct seasonal services to Avignon in the south of France, and winter services to Bourg-Saint-Maurice, Aime-la-Plagne and Moutiers in the French Alps. "Longer term, launching direct services to Amsterdam would be an interesting proposition," he says. "It is already a very popular destination for UK visitors, attracting more than three million annually. "But we are talking between five and 10 years away."